Norida Beach Hotel is a comfortable high-standard all-inclusive resort, where good service meets hospitality and original smile. It is the right choice for couples and families seeking quality accommodation in a quiet location combining sea and mountain views. 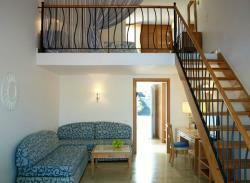 Totally renovated in 2012, all 455 comfortable and spacious guest rooms offer all the facilities of a 5-star resort. 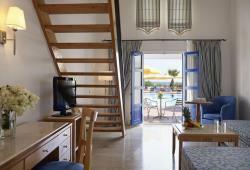 The hotel is surrounded by immense gardens and is decorated with warm colours, marble floors and wooden furniture. The magnificent views of the Aegean Sea and the volcanic island of Nissiros will help you relax while enjoying one of the nice cocktails. The Norida Beach Hotel welcomes families with a dedicated kids & teens activities programme offering imaginative activities for kids of all ages (from 4 to 12 years old). Also, a multilingual animation team provides an exciting entertainment program throughout the day & night, with games, musicals, sketches, shows, competitions, etc. Live music programs are offered on Casablanca Bar. A splendid open air theatre is located in the middle of the Mitsis World, between the 4 hotel complexes of Blue Domes Exclusive Resort & Spa, Norida Beach Hotel, Family Village Beach Hotel and Summer Palace. It can welcome up to 700 pax and is also equipped with its own bar. It operates from 20:00 to 23:30. 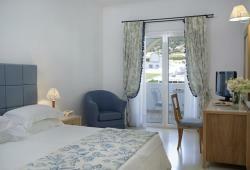 The hotel provides a conference room (capacity of 100 pax). All room types include the comforts and amenities guests can expect from a luxury 5-star hotel. They are individually designed in a contemporary style with personal touches and quietly overlook the hotel’s landscaped gardens. Guests will forget very soon that they are in a hotel and feel thoroughly at home. 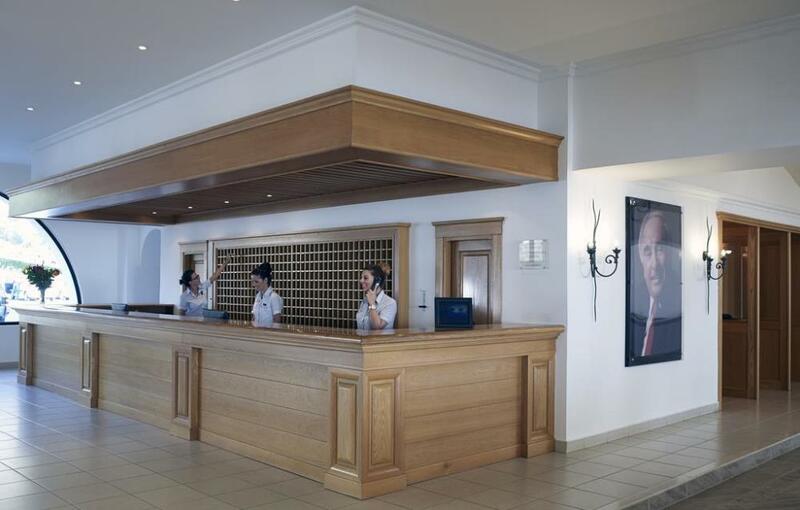 All room types include the comforts and amenities guests can expect from a luxury 5-star hotel. 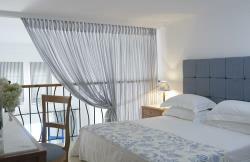 They are individually designed in a contemporary style with personal touches and quietly overlook the sea. Guests will forget very soon that they are in a hotel and feel thoroughly at home. The main restaurant offers local and international cuisine, presented on a buffet with show cooking. Special theme nights are organized regularly, where guests have the opportunity to taste different types of cuisine, such as Greek, Italian or fish specialties. The following drinks are inclusive: house wine, ouzo, beer, juices and soft drinks, alcoholic cocktails and kids’ cocktails, alcoholic drinks (international brands). Children’s corner is also available in the main restaurant. A new entry to bring the best catch of the day right to your dish. A variety of hot and cold snacks, such as sandwiches, ice creams, and pastries are served throughout the day and night in the Villagio Café and the Beach bar. Ice creams are available from 10:00 to 02:00. The new focal point of the hotel, serving your coffee and drinks by the 5 new pools. Located at the main building, it is the ideal spot to enjoy a refreshing drink, a snack, an ice cream or an afternoon cake. A tasty snack is always there for the guests to enjoy. Chef’s specialties varying according to the time of the day are making it the hot spot. Kid’s cocktails offered for children. Sitting inside or outside at the terrace you‘ll enjoy the ambiance of this unique bar. 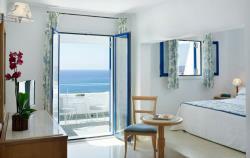 Situated in the main Hotel, offers a magnificent view to the Aegean Sea. One of the waitresses will be happy to recommend one of the nice cocktails while you enjoy the nice view. Guests can experience one of the unique animation shows at the complex’s theatre (dance shows, competitions, game shows, theatre etc.) by enjoying their drink. Beer, wine, cocktails, long drinks, alcoholic and non-alcoholic drinks are served. A variety of snacks and your favourite drinks on the beach side, just a small from your sun bed. 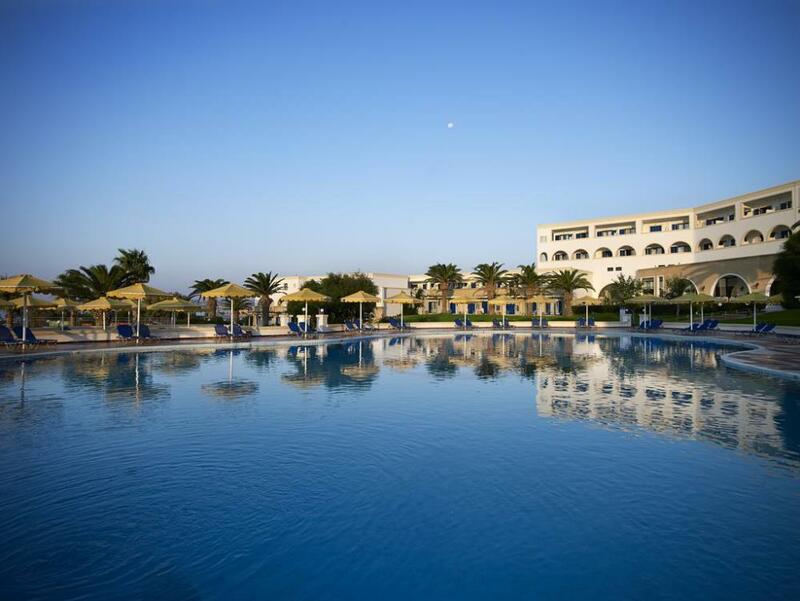 The hotel offer a range of free sports and recreational facilities within the hotel’s grounds. 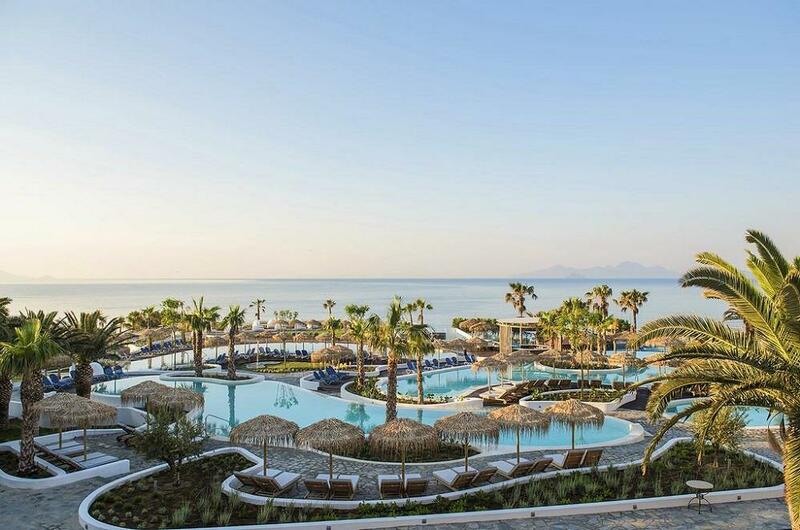 Whether you choose to spend your days by the pools, the sea or on the tennis courts, they have professional staff here to guide you on your endless escapades. The nights are as luxurious as the days with plenty of dancing, live music and lively people. 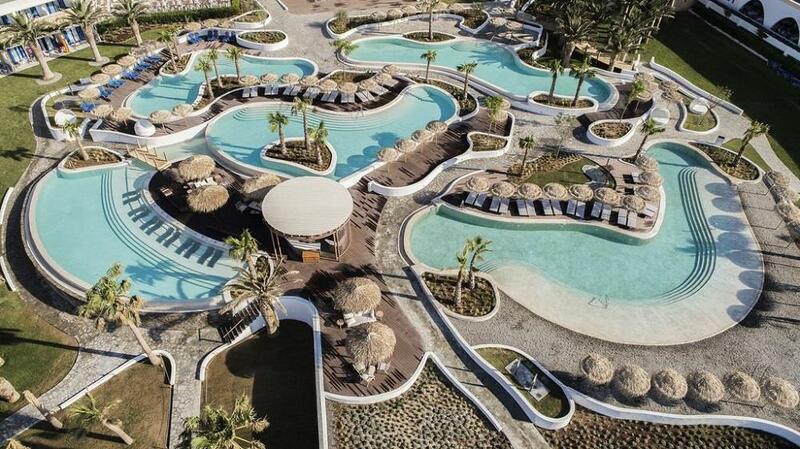 Also, guests can choose between the 7 outdoor swimming pools (5 with sea water, 1 with waterslides and fresh water and 1 baby swimming pool with fresh water), the “relax pool”, the 2 amazing water slides for adults, 1 waterslide for kids and the beautiful pebble beach. Fresh fruit and iced water are available around the pools and on the beach, during high season. 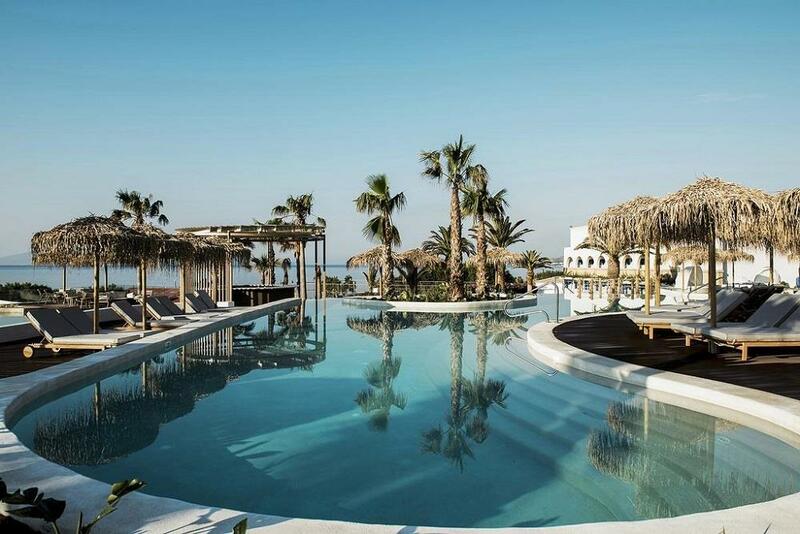 Beach towels as well as umbrellas & sun beds by the pools and the beach are available free of charge.